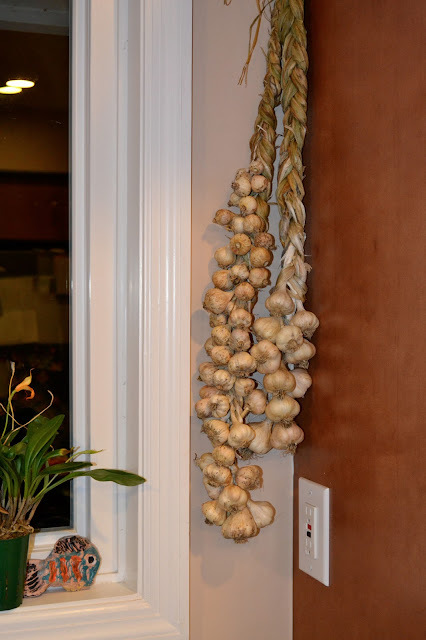 Garlic: A Stylish Display to Ward Off Vampires. With a pre-teen girl in the house, there's bound to be a brief obsession with Twilight. I'll admit--I read the books, and I even went to the first movie with my book club friends. I know. My credibility is shot now, isn't it? Until recently, though, the first movie ended my Twilight entertainment-spree. But then, somehow, our tween girlie entered the land of vampires and werewolves. She read the book series four times. She watched the movies on a continuous loop. She even convinced me to stay awake until 2 a.m. to watch the remaining movies with her. By the way--she's Team Edward all the way. Finally, after weeks of vampire talk, we confiscated the books and movies and told her it was time to move on to other entertainment. Truly, though, her obsession with vampires made me think we'd need to hang garlic around her neck to ward off future, potentially undead, boyfriends. 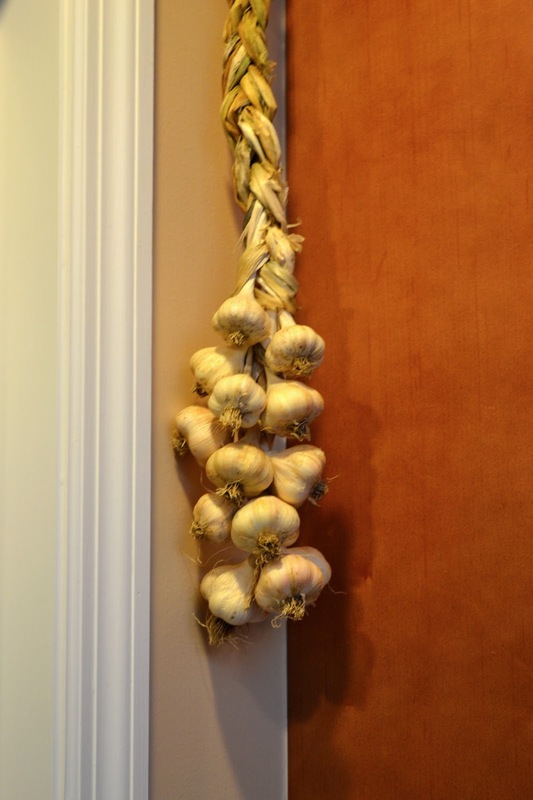 Instead, we decided to decorate the kitchen with our garlic harvest. It's still within easy reach should a vampire decide to pay a house call. For several years, I've wanted to make a garlic braid to hang in the kitchen, but somehow--it never happened. As we all know, I'm not the craftiest person. I'll Pin all kinds of adorable garden crafts, but the reality is that my projects never turn out quite as I envision them. In fact, I've been known to buy all of the components for a project--and then chicken out, fearing my disappointment when my efforts don't measure up to the original project. I think I have Pinaphobia...the fear of craftiness failure. But honestly, a garlic braid? That shouldn't be complicated, right? Here's a reality check: my vampire-crazy girl just got her first French braid--at the hairdressers'. You see, I can't braid. Well, I can't French braid. And from what I read, making a garlic braid is much like French braiding--you keep adding in pieces (in this case, garlic stems) to form the braid. Because Kristen constantly braids horse tails and manes, the thought of braiding doesn't throw her into a panic. She volunteered to make the braid, while I played photographer. Before the braiding begins, you first need some garlic. Fortunately, two weeks ago, I harvested our garlic. It was one of those evenings when I trudged to the garden in my decent clothes, just to take a peek at the beds, and wound up harvesting garlic because it suddenly looked ready. I know. This is why I never have any decent clothes--they're all stained and nasty from my impromptu garden forays. After harvesting garlic from the garden, it needs to cure for about two weeks in a shady location. The racks in our garage provided the perfect garlic-curing station. Of course, my poor Prius sat in the driveway, but our garage smelled like an Italian restaurant for two weeks. Mmmm. Don't wash the garlic--just remove as much soil as possible. 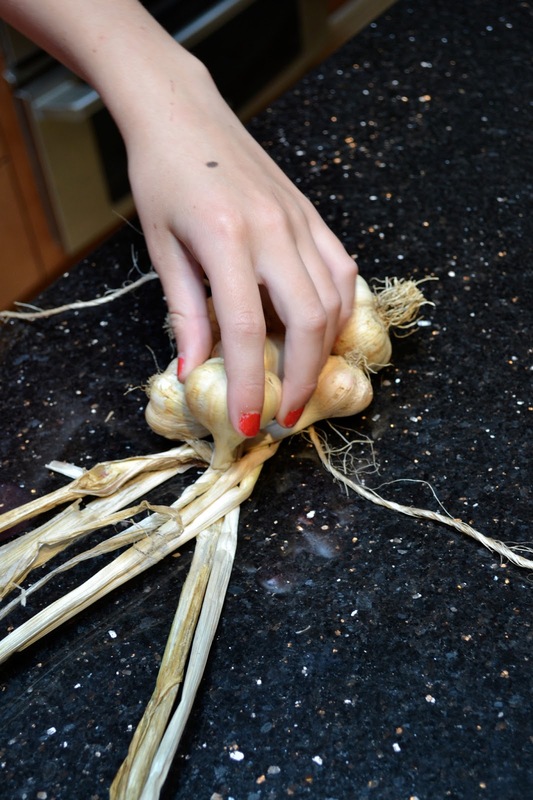 After the garlic dries, the soil will be easier to brush off the bulbs. 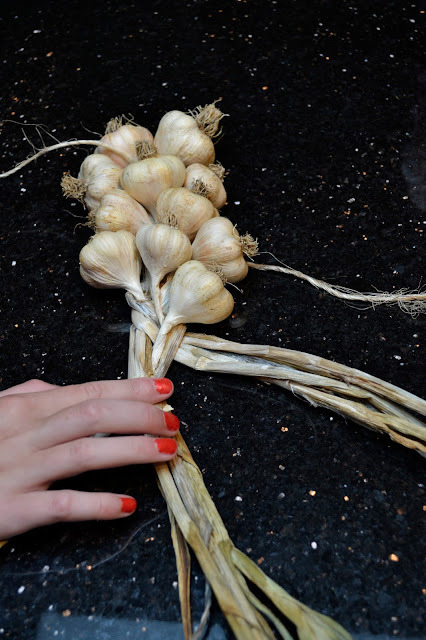 If you didn't plant garlic last fall, never fear--visit your local Farmers' Market and buy some beautiful softneck garlic (with the stems still attached.) I saw gorgeous varieties at my local market last Saturday. Remove as much soil as possible from the bulbs. You can use a soft toothbrush, or you can use a brightly painted fingernail to remove the dirt and outer wrapper of the bulb. Using scissors, trim the roots of the bulbs to about 1/2 inch. Several sites recommend soaking the leaves (which I'm referring to as stems, although softneck garlic doesn't really have "stems") of the garlic to make them more pliable. Our garlic stems were quite flexible, so we didn't bother with this step. If your garlic is extremely dry or brittle, you may want to place the stems between two wet towels until the stems soften and bend easily. Cut two pieces of twine, approximately two feet in length. Select three large softneck garlic bulbs and place them side-by-side, with the center bulb slightly lower. 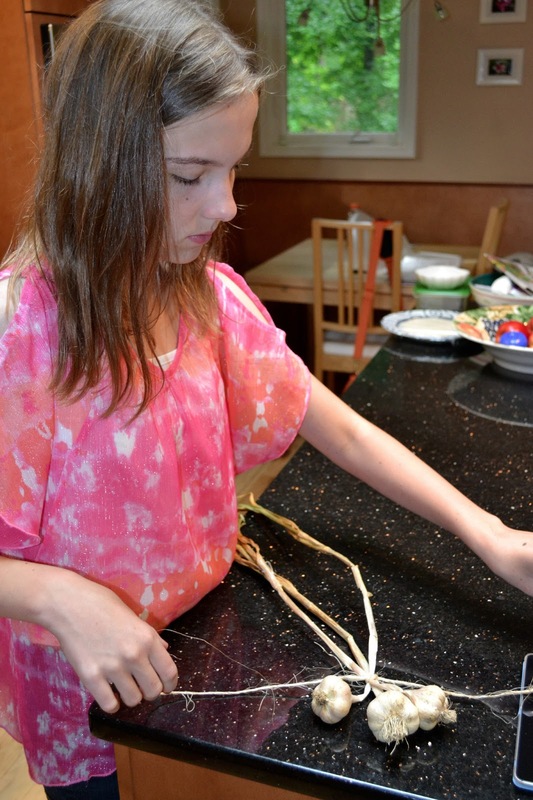 Only use softneck garlic, as hardneck garlic will not be pliable enough to braid. Now the fun begins. Cross the right stem over the middle, then cross the left stem. The first, easy step in braiding. Now, the fun begins. Add another bulb to the right, but place the stem in the middle. Cross the right stem over the two middle stems. The "right" stem is now in the center. Then add another bulb to the middle, again keeping the stem in the center. Cross the left stem over the middle. Now, the "left" stem is in the center. Add another bulb to the left side, stem centered, and cross the new left pieces over the additional stem. Continue adding bulbs, always aligning the new bulb's stem with the center stems, then crossing over. So glad my girl volunteered to help, because I can't imagine trying my hand at braiding--and juggling the camera. There's no way it would have ended well. For the first braid, we selected 13 bulbs. As we reached lucky 13, we centered it at the top. 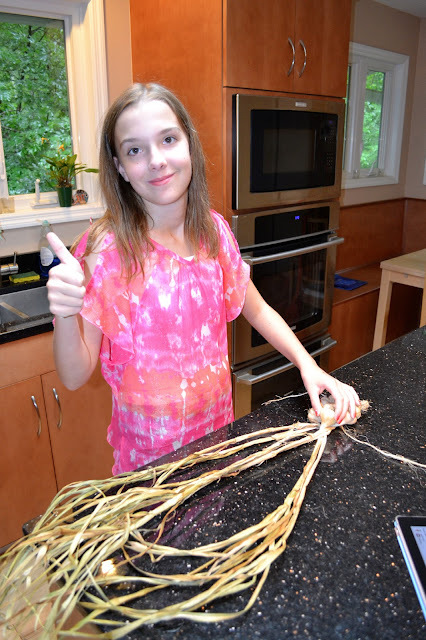 Once all of the bulbs were braided in, Kristen continued braiding the stems, forming a nice, even six-inch braid. Finally, using the second piece of twine, she tied off the braid, first making a knot to secure it, and then adding a bow for cuteness. Pretty cute, don't you think? 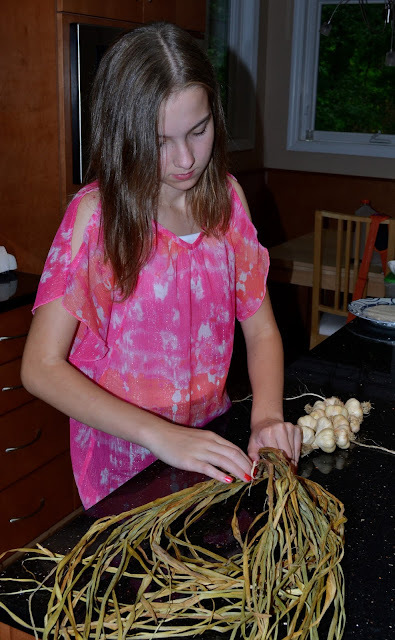 Inspired by my daughter's braiding ability, I tried my hand at it, making a longer braid of some of the smaller garlic bulbs. I'm just not meant for projects like this. I kept confusing myself, trying to remember which stem needed to cross where. Good grief. Still, I didn't give up, and we now have two garlic braids hanging in the kitchen, within easy reach should Edward Cullen decide to appear. And I've promised Kristen that I will watch many YouTube videos to learn how to French braid this summer. It's the least I can do, because too soon she won't want me invading her space and helping with her hair. 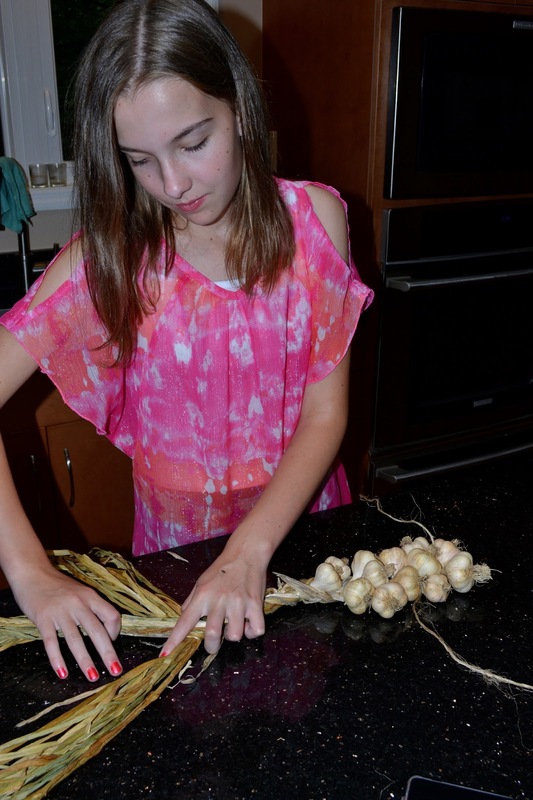 Do you have a favorite garlic recipe? Mine is shrimp scampi, which you can find here.